When I found out that Holley had suffered from Bell’s palsy I quickly messaged her that I had also had it. She asked if I would mind sharing part of my Bell’s palsy journey, so here it is. 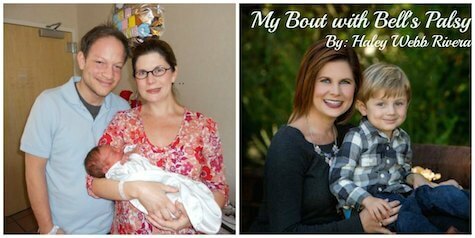 It was January of 2011 and, I was anxiously awaiting the arrival of my son, my first (and only) child. On Friday January 14th, my husband and I went out for our last date night before our baby, Jackson, was due on January 19th. We had a great dinner and it was a relaxing night. On that Friday I was still feeling great and everything seemed to be going along just swimmingly. When I woke up Saturday morning, January 15th, that all changed. My husband had already left for work when I looked in the mirror and saw that my face just didn’t look quite right. I started taking pictures, calling my midwife, nurses, doctors and anyone that I could get a hold of on a Saturday morning. It was determined that I probably had Bell’s palsy and that I should head to the emergency room; that I needed steroids and anti-viral medication quickly. My mom happened to be in town, in anticipation of her first grandchild, so off she and I went to the emergency room. Once there, we waited for 9.5 hours for my name to be called. Finally, when it was called I was taken to a little quick clinic within the hospital and waited for another 1.5 hours. They wanted to just send me home with steroids. My mom and I basically refused to go until they gave me the anti-viral medication as well. All of the doctors and nurses that I spoke to before going in told me to be sure to get both. You see, my full time job is on television. I am a Meteorologist at NBC-2 in Fort Myers, FL, so I knew that I needed to get my face working properly again quickly. I was going to do anything I possibly could to get it to return to normal. Hungry and tired from spending the entire day at the emergency room, we left and picked up some food on the way to get my medicine at the pharmacy. Through the day on Sunday I just took my medicines as directed, rested and talked with my boss about the fact that even though I didn’t have a baby yet, I would have to go on leave, because of my face. On Monday morning, January 17th, I went to my regular check up and asked to be induced. In my mind I just wanted to “get this baby out”, so that I could at least get rid of some of the swelling and pressure on the nerves that were damaged in my face. After about a 30 minute lecture of all of the reasons that I do not want to be induced, how much harder it would be on my body and the dangers of it, the nurse then stripped my membranes to try to help my body want to go into labor on its own. I had not even begun to dilate despite being just 2 days form my due date. I was then told to come back later for an ultrasound. Well, I had just had one before the nurse practitioner gave me that little talk. No one had given her my ultrasound. She went and got it from the tech and returned saying “Ok, forget everything I just told you about not wanting to be induced. You have barely any amniotic fluid left and we need to get this baby out as quickly as possible.” Home I went to eat lunch and pack a bag before my 4:30 induction appointment, knowing all of the risks and difficulties with being induced. Long story short, I went in for the induction Monday afternoon and had my sweet boy at 12:19 pm Tuesday January 18th after a long, stressful delivery (that’s a whole other story). Finally, on Thursday I was discharged from the hospital. I was very depressed. All of the pictures of me before delivery and with my new baby had this ridiculous face. 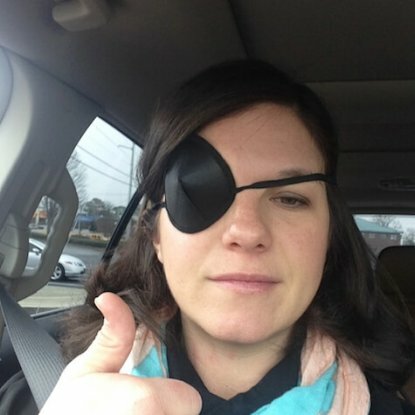 I wore an eye patch through my hospital stay and for a while after returning home since my eye wouldn’t close. It was necessary for sleeping at night for quite a while. My dad had come in town and had planned to stay for a week, but had to leave after just a couple of days. My mom was going to be with me for 2 weeks to keep up with the house, cooking, laundry, and whatnot, so that I could focus just on me and baby. Her father passed away when Jackson was just 6 days old and she left town for the funeral. I was distraught to say the least. Here I was 1 week post-partum with my mom and dad gone much sooner than expected, my husband at work, and dealing with the grief of losing my precious grandfather, a new baby, and Bell’s palsy. Jackson was a colicky baby, too. Loud noises hurt my ear tremendously. When Jackson cried, I just cried along with him. 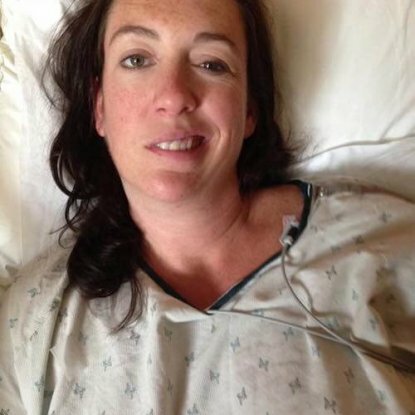 I tell you all of this not as a sob story or complaint, but because doctors kept giving advice to try not to stress about anything, and to get plenty of rest. Both of those things were nearly impossible. I cried a lot, wondered if I would still have a job. It was so stressful. My face was so paralyzed that I was slurring my words very badly and my boss even said it sounded like I was drunk when I called him. When I tried to eat or drink, food literally just fell out of my mouth onto the table and drinks dribbled down my chin. Combine that stress with the stress of a new baby and I was totally overwhelmed. I saw a neurologist, one of the best the area, and he told me that my face was one of the worst that he had seen. He gave me medicines for nerve pain; we tried many different ones, but nothing really got rid of the headaches and ear pain. I also saw two natural doctors, one of whom did chiropractic care as well. They put me on natural supplements to help with nerve healing/regenerating. One of those doctors also did electrical acupuncture to stimulate the nerves. Fortunately my face was at least a bit closer to normal by the time my maternity leave ended. It was at least 6 months before I started to feel like I didn’t look weird. Even four years later, I still look a bit different than I did before the Bell’s palsy, but I doubt anyone other than me can tell. If you watch very closely my right eye blinks just a bit more slowly than the left. Many times my smile still moves to the left a bit and my mouth just doesn’t move the way it used too. Some spoons are still difficult for me to use. I struggled with migraines for a few years following the Bell’s palsy, but it is seldom that I get a headache now. Although it technically is just your face, and many might see it as superficial, when food is falling out of your mouth, you are slurring your speech, and your head is hurting so badly you end up in the hospital again; it starts to impact a much larger part of you physically and psychologically. Right now Bell’s seems like a distant memory. I know there is the possibility of it returning. Stress will sometimes make my face twitch and that makes me nervous that it is going to come back. My neurologist also told me that if I were to get pregnant again, I would have an increased risk of the palsy coming back. Bell’s palsy is something that will lurk in the back of my mind for the rest of my life, but not something that will overwhelm the rest of my life. Hoping for healing for any of you dealing with this frustrating condition. Haley I truly admire you! Your gorgeous, inspirational and just amazing! I understand your fear of it coming back. I too had a bout with it and I remember going to our local clinic and my Doctor before it was all over. I was in so much pain and no one seemed to have any answers for me as to exactly when things would get better. I give you so much praise towards the fact that you handled a lot on your own. I didn’t have that new born to think about. I do admit that I will never forget what happened and I, like you, will keep it in the back of my mind. It was a very scary experience. Kim, I hate that you also had a bout too. Have you recovered? Have you ever had any feelings of it coming back? I think the tingling and twitching when I get stressed or tired is what really scares me. Thank you for your kind words. 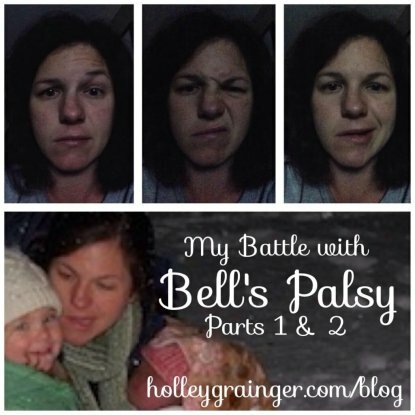 I had my first bout of Bell’s palsy after the birth of my youngest daughter who is now 22. I really felt like I was having a stroke, after a long wait at the hospital I was given steroids and an appointment to see physiotherapist. After several days of physio to try and get my facial muscles working again, the physio referred me back to the hospital as she was concerned about my eye. I was told that my cornea was drying and there was a risk that I could loose sight in that eye. Many eye drops, eye patches and daily physio appointments later I was almost back to my old self. However since that first bout I have had another 3 attacks of Bell’s palsy. I have been left with a very slight droop on my left eye lid which gets worse the more tired I get, I also dribble from the left side of my mouth when I’m over tired and if I’m under stress my eye twitches, ( not very attractive). I know what signs to look for now in myself and others,only last year I noticed a work colleague with recognisable symptoms and advised her to go to the hospital to be seen straight away. I’m terrified of recurrence. The symptoms you described (eye drop, dribble, twitches) are all ones I still experience when I’m tired and stressed. So glad you were able to help your coworker!